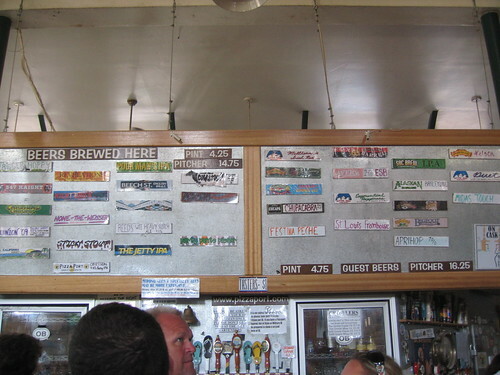 We headed further south to Beachwood BBQ in Seal Beach, which was quite advantageously having its Sour Beer Week. 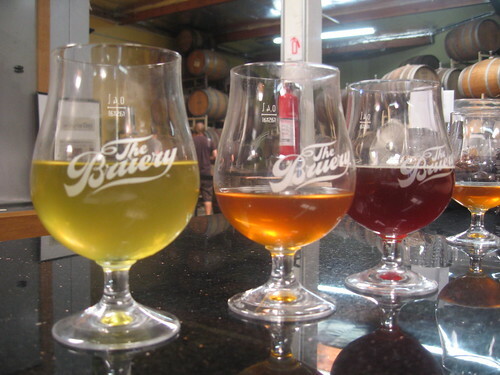 Unlike the others, I’m still having my first exposures to sour beer but indeed I’m finding myself getting acclimated to that characteristic tang (check out this article written by Josh for the LA Times on sour beer). From left to right: Love Barrel #13 from New Belgian Brewing Co., Green Monster from Deschutes, Tart Lychee from New Belgian Brewing Co. and Abbeye De Saint Bon-Chien, Vintage 2007 from Brasserie Des-Fraiches Montagnes. Despite only starting to have enjoyed beer a little over the past year, I could get used to sour beer – in moderation. It’s a whole new dimension in beer tasting. Too sour? Not sour enough? And what notes to achieve that sour taste does one prefer? 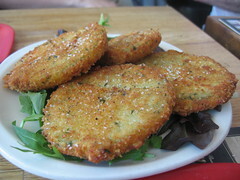 And then came time to grub – and fried green tomatoes were quite the treat! It was my first time actually having the dish and it was a welcome treat. The tomatoes were succulent inside the breading and the dish overall was seasoned perfectly. 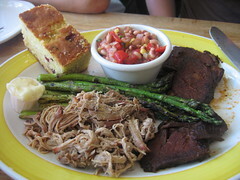 The combo BBQ platter was also tasty, complete with a side of roasted, smoked asparagus and a salad of tomatoes, onion and black-eyed peas. 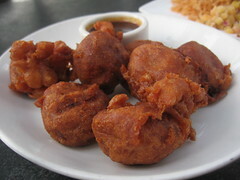 The hush puppies were also delicious. 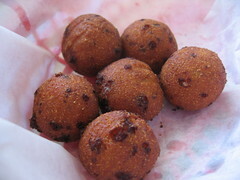 Hot, juicy and great fried cornbread – but let’s face it, I am a lover of all things with jalapeÃ±o. 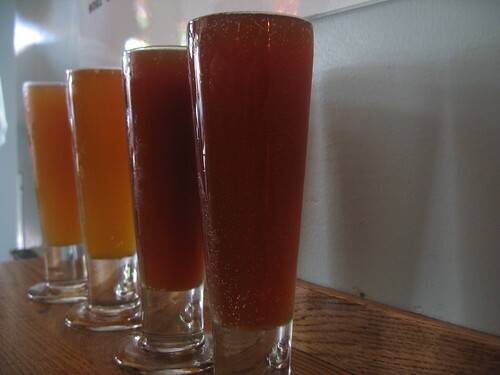 We drove even further south to Carlsbad Pizza Port to “deepen” our beer experience. An impressive house brew list, they did have – unfortunately, their surprisingly reputable pizza didn’t live up to the task. Off my game for a moment and feeling unadventurous, I went with a certain guest brew (Midas Touch) and was ready to grub some more. So while their doughy crust and tasteless tomato sauce went overpowered with too much cheese – the Pizza Port experience kind of offered respite from the afternoon for me. 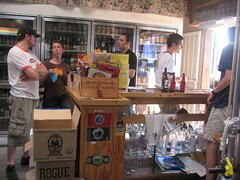 Next up was the adjacent Bottle Shop, where you could take home some of the best and rarest brews. I had already selected a bottle of The Bruery’s Trade Winds Tripel Ale with Thai basil (an absolutely delicious beer) while we were there and was watching my *cough* fiscal discipline so I declined a purchase from this store. But I’d love to be back with some additional beer knowledge in tow and would go to town with some purchases. 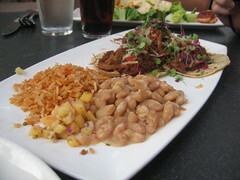 Next up was Stone Brewing Company’s epic-sized restaurant, Stone Brewery World Bistro & Gardens. It was my first trip to Stone, who are known for their characteristically strong brews. It was like stepping into an Orange County-esque brewtown of industrial proportions. Ginormous ceilings, multiple mezzanines, concrete structures, supplanted bamboo tufts and picturesque ponds strategically placed amongst diners – it’s an experience you have to have; one you have to see to believe. And now comes time for an ego-crushing confession. I was just absolutely so full of pizza, of beer – of tons of goodies and treats – that I had to bow out at Stone. Instead, I scenically enjoyed what everyone ordered. Josh ordered the duck tacos, which I was actually recommended by H.C. but joyfully watched Josh and his better counterpart Allison enjoy. Also ordered were spud buds. What an exhausting trip – but well worth it. I passed out in my usual fashion on the way home. It was good to try out the “spots to hit” in areas that I normally wouldn’t be well-versed in down south. I also found out that I can pretty much cap out my beer crawl spots at four! This entry was posted in Orange County, San Diego and tagged Beachwood BBQ, beer, beer tour, Bottle Shop, Carlsbad, Escondido, Pizza Port, Seal Beach, Stone Brewery, Stone World Bistro & Gardens, The Bruery. Bookmark the permalink.